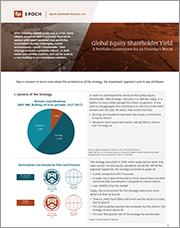 Global Equity Shareholder Yield - Epoch Investment Partners, Inc.
Seeks superior total and risk-adjusted returns with high dividend income and below-market volatility. At a Glance Our Global Equity Shareholder Yield strategy pursues attractive total returns with an above-average level of income by investing in a diversified portfolio of global companies with strong and growing free cash flow. Companies in the portfolio possess managements that focus on creating value for shareholders through consistent and rational capital allocation policies with an emphasis on cash dividends, share repurchases and debt reduction — the key components of shareholder yield. The portfolio generally holds between 90 and 120 stocks from equity markets worldwide, with risk controls to diversify the sources of shareholder yield and minimize volatility. Epoch’s Distinct Investment Philosophy and Approach The bedrock of our philosophy is that the growth and applications of free cash flow represent the best predictor of long-term shareholder return. As a result, our security selection process is focused on free-cash-flow metrics and capital allocation as opposed to traditional accounting-based metrics such as price-to-book and price-to-earnings. We look for a consistent, straightforward ability to generate free cash flow and to allocate it effectively among internal reinvestment opportunities, acquisitions, dividends, share repurchases and debt pay downs. An essential factor is the evaluation of each company’s management team to confirm their commitment to transparency and building shareholder value. The companies uncovered by this process have inherently less volatility due to their ability to generate cash flow. This strategy uses proprietary quantitative research to identify potential investments. We look for factors including high current dividend yield, growth in cash flow, cash from operations that exceeds dividends and no dividend cancellations. Stocks are then subject to rigorous fundamental research. We develop an investment thesis as we assess the sources of the company’s long-term value creation and management’s ability to nurture it. Management’s track record of allocating capital is scrutinized as we look for those with the discipline to return cash to shareholders if the expected return for other uses of cash does not exceed the firm’s cost of capital. We select stocks that can meet our 6% shareholder yield requirements, with 4.5% coming from dividends and 1.5% coming from share buybacks and debt repayments. We also look for a 3% minimum growth rate of cash flow. Once a stock has been purchased for the portfolio, we continually revisit our thesis and sell the stock if it appears the company will no longer be able to provide the required level of shareholder yield or if we see another investment with the characteristics we are looking for with less risk. While the portfolio is constructed from the bottom up, decisions are made with consideration of the macro context. Epoch’s Investment Policy Group, composed of senior members of our different strategy groups, provides insight and guidance on the global market environment and macroeconomic and industry trends. We analyze risk as part of the portfolio construction process to monitor portfolio volatility and better ensure the delivery of the strategy’s goals. A senior member of the Quantitative Research and Risk Management team is a co-portfolio manager on every strategy managed by Epoch so that portfolio managers are aware of unintended biases and the effect individual securities may have on the portfolio. The portfolio is diversified across sectors and sources of yield so that no single stock is relied on too heavily to achieve the portfolio’s yield targets. Differences reflect higher dividends outside the U.S. and more share buybacks within the U.S. Proven in down markets: In three-month periods where the market was down more than 5% in USD the strategy outperformed 96% of the time, by an average of 4.1%. Potential for capital appreciation, driven by cash flow growth, make the strategy attractive in most market environments.